Kayaks were invented and first used by the Inuit, more traditionally referred to as Eskimos. Their craft were constructed using skins on a frame of driftwood - since the Eskimos lived beyond the tree-line, this was their only option. The boats were lightweight and robust. They were used for hunting. Although many different types of kayak exist today, from long sleek sea kayaks, ideal for touring, to impossibly short playboats for tricks and tight manoeuvers, the basic idea is the same as the original Inuit boats. A kayak is defined as a boat which you sit in and power with a double-bladed paddle. Paddlepower and Adventure can offer a wide variety of expeditions for both novice and expert. These can be anything from one-day river trips on gentle water, to multi-day sea kayak tours. You will find some scheduled trips on our Course Programme, but we would very much like to hear what you would like to do, as customised adventures are our speciality. Intermediate courses are for those who have done more than one week of kayaking and want to progress their skills, or for those who want to have a go at another discipline. Advanced courses are open ended and are open to anyone who is comfortable on grade 3 rivers and wanting to improve their skills on this grade or move up to grade 4. The most basic course would be an introduction to kayaking. This is suitable for beginners, or those who have no previous experience whatsoever. Here we would like to dispel a common myth: it is not necessary to learn to roll your kayak to enjoying kayaking. Rolling is an advanced technique - many people safely enjoy this sport without ever learning this challenging self-rescue technique. (Of course if you are keen to learn how, we can help!). Beyond the basics, we would recommend that you follow the BCU star award scheme. This will give you a qualification which is recognised nationwide, and which will enable others to identify where you are in your skill progression. The 3 star White Water Kayak award is discipline specific. It is an intermediate level course, designed to show that the candidate can paddle on moving water, up to and including grade 2. It will also show that the candidate can operate as part of a led group, and can contribute to the smooth running of a trip in this environment. As well as looking at skills to control the boat, and stay in control, you will find out how to choose appropriate lines on the river. We will also look at water features and how these interact with the boat and affect the boat's handling. Click this link for the BCU 3 Star White Water Kayak syllabus (External Site). Paddlepower and Adventure run both training and assessment courses for 3 star White Water Kayak. 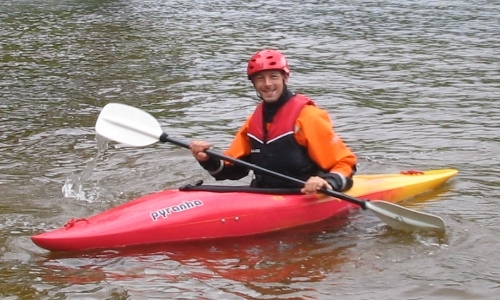 Click Course Programme for 3 Star White Water Kayak courses. The 3 star sea kayak award is discipline specific. It is an intermediate level course, designed to show that the candidate can journey in a moderate tidal environment as part of a led group with winds no more than force 4. This course will give the candidates the necessary skills to be able to manoeuvre their sea kayak in these conditions. As well as looking at skills to control the boat we will also look at how wind affects the boat and look at water features and how these interact with and affect the boat's handling. Click this link for the BCU 3 Star Sea Kayak syllabus (External Site). Paddlepower and Adventure run both training and assessment courses for 3 star Sea Kayak. Click Course Programme for 3 Star Sea Kayak courses. 4 Star White Water Leader is a leadership award designed to show that the candidate can lead people on moving water up to and including grade 2 and be led on water up to grade 3. This course will give the candidate the necessary skills to lead people in this environment, including personal paddling, rescue skills and leadership strategies. Click this link for the BCU 4 Star White Water Leader syllabus (External Site). Paddlepower and Adventure run both training and assessment courses for 4 Star White Water Leader. Click Course Programme for 4 Star White Water Leader courses. 4 Star sea kayak is a leadership award designed to show that the candidate can lead competent paddlers (competent means people that do not require coaching to be in this environment) on moderate tidal waters with winds no more than force 4 and sea state 4. This course will give the candidate the necessary skills to lead people in this environment, including personal paddling, rescue skills and leadership strategies. Click this link for the BCU 4 Star Sea Kayak syllabus (External Site). Paddlepower and Adventure run both training and assessment courses for 4 Star Sea Kayak. Click Course Programme for 4 Star Sea Kayak courses.